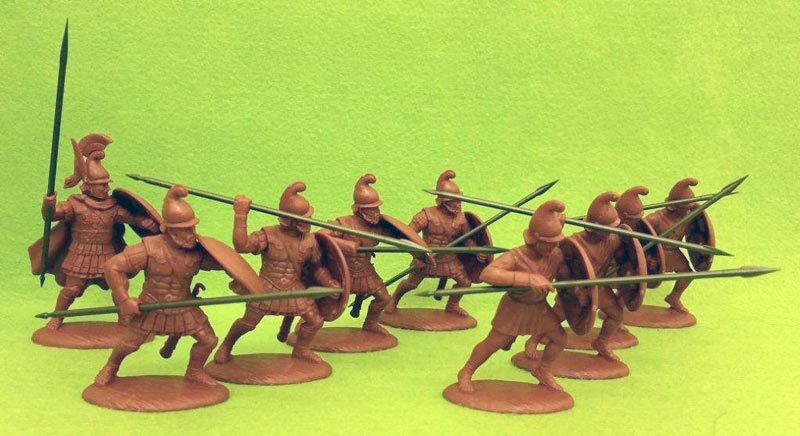 9 models – 1 Officer + 8 Soldiers, 4 in armor, and 4 unarmored – with spear plus options for javelin and sword. The Macedonain Hypaspist was their equivalent of the heavy Greek Hoplite infantryman. Armed with a hoplon shield, heavy spear (with a sword for backup) a bronze helmet and body armor, these elite troops were tasked with guarding the exposed right flank of a phalanx in battle, and were prominent in siege warfare. They were also used for irregular duties. Composed of the sons of Macedon's ruling class, they were also tasked with forming Alexander's personal bodyguard.